A while back I said I would update how my Supergirl collection is displayed at home now. The addition of larger items forced me to move everything from a smallish corner cabinet to the entertainment center that houses the television in my tiny corner of the basement. With the addition of the Terry Dodson Supergirl bust, I figured now was as good a time as any. The top shelf is the sparsest. It also is the 'Silver Age' shelf. Since there aren't many pieces, the display really highlights the DC Direct statue of the Action Comics #252 cover which I think is the signature piece of the collection. 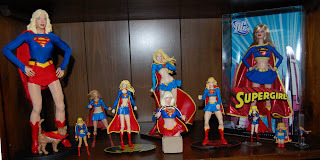 Surrounding it are the Silver Age Supergirl action figure with Streaky and Midvale sign, the Pocket Heroes Supergirl, the Adam Hughes 'Women of the DC Universe' bust, and a Supergirl bobble head doll. While it is the Matrix costume, she is emerging from the rocket and so was put on this shelf. The shelf below is the 'current costume shelf. The Terry Dodson bust stands front and center and adds a bit of coverage for the minimally dressed Kotobukiya vinyl statue. The 'bookends' are the Barbie Supergirl and the Deluxe figure (which stands out for being in the Matrix style costume as well). Between them are a number of figures - Microman Japanese import, DC Minimate, Heroclix, Infinite Heroes, Return of Supergirl (Turner style), Superman/Batman (McGuiness style), and DC Diorama. The last shelf is mostly the 'white shirt' costume and the Crisis uniform albeit with some 'others'. The white shirt collection includes the Warner Brothers store plush, DC Animated statue, JLU paper weight, DC Direct action figure and DC sculpt figure. The Crisis section includes the COIE action figure, the Crisis pocket figure, and the ERTL diecast. There also is a custom made Lego Supergirl, the Elseworld's Finest figure, the Justice hot pants figure, and the Bruckner Matrux-style mini-statue. As always, there are pieces I would love to have in the collection. The Bruckner full size statue, based on the Peter David/Gary Frank Supergirl run is the one I crave the most. But there is a Michael Turner statue and the pieta-like Crisis on Infinite Earths statue. Anyways, when pieces get added, I will update again. Hope you enjoy. One thing that has been very good about the super-titles in the past year or so is the effort the creators have put in to have the stories really mesh, taking place in one super-universe. Each story organically feels like an extension of the other. Part of that has been over-arching stories of New Krypton and Project 7734. But the other part is having a consistent vision of characters so that the Lois in Action acts like the Lois in Superman and acts like the Lois in Supergirl. I know 'continuity' sometimes sounds like a curse word but for a family of titles like Superman, I think it is crucial. It is more than just slapping a red numbered triangle on the cover. It is making sure everyone is on the same page. 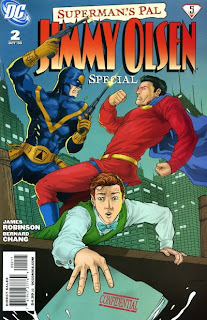 When stand alone issues like Superman's Pal Jimmy Olsen #2 (or Superman Secret Files) come out, I have felt like I should purchase them knowing that commitment to the larger picture currently exists. These specials have been like another domino in a long storyline rather than a completely seperate and disconnected story. This story seems to ask as many questions as it answers. And it focuses on a place in the DCU I know little about and so I felt a bit lost. There is no doubt however, given the ending of the issue, that it did impact the super-family. We have seen Jimmy doing his best investigative reporting to crack open the Project 7734 story. 7734 is aware of his digging and in the past Agent Assassin has surfaced to put a little scare into Jimmy. That cloying fear and very real threat has been on Jimmy's mind for a while. Whether or not these visions of Assassin are real or imaginary, Jimmy is kicking over a few too many stones, upsetting a few too many bad guys. With Superman out of town, Mon-El has been put in charge of keeping Jimmy alive. The Daxamite is attuned to the signal watch and ready to swoop in and save the day. I do like how whenever Agent Assassin is shown, he is 'blipping' in and out of sight. We often see the same panel - one with Assassin and one without. It really shows just how unnerving that would be to the target... how maddening and terrifying that would be. Despite feeling marked for death, Jimmy continues investigating 7734. He is an investigative reporter and nothing will stop him from that duty. Of all the things that have come from the two Jimmy Olsen specials, this is the thing I like the most. We are seeing Jimmy transform into a more formidable character in the DCU, more like the Mr. Action of the later Silver Age. His efforts pay off. He gets contacted by someone on-line named Eternity-7734 who seems to know a lot about the project. The informant talks about 'Project Breach' a planet-killer that 7734 has under its control. Jimmy agrees to meet this person to gather more information. Unfortunately, that conversation is discovered by General Lane. It is time for Agent Assassin to clean up the Jimmy Olsen mess. When Jimmy pulls up to the arranged meeting place, he finds the house on fire. Risking his life, Jimmy runs in and carries out his informant. It does not escape Jimmy that this fire is both good and bad news. It is good because it means that Eternity 7734 probably knows something. It is bad because 7734 tried to kill him for that knowledge. Someone set that fire, maybe someone nearby. And here is where I may need some help. 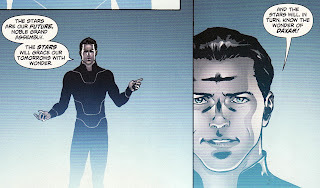 Turns out the informant is someone named Fury, a shape-changer from Infinity Inc. a comic I know almost nithing about. It seems that each form has its own personality. The male Erik is insane and seems like a paranoid schizophrenic. The female Erika is stronger and more lucid. 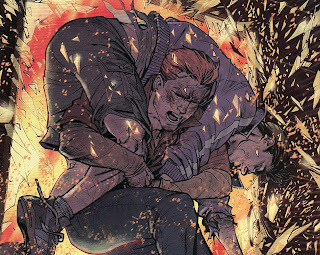 It was Agent Assassin who torched the house after he tortured Erik. But Erik didn't know the secrets about 7734. It was Erika. And so it is Erika who is able to give Jimmy the next number he needs to call. She also whispers something into Jimmy's ear that we are not privy to. 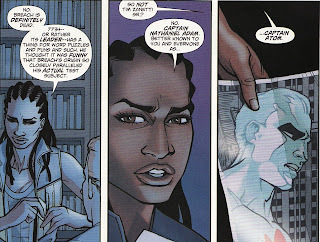 That number leads Jimmy to none other than Natasha Irons, Steel's niece and member of Infinity Inc. But 7734's Breach actually refers to Captain Atom. Breach and Atom's origins are very similar. So General Lane named the Captain Atom project Breach as a sort of joke. The information about the Breach project is worrisome. A mind-wiped Captain Atom was found by 7734 and is currently being programmed to carry out their bidding. Hmmm ... maybe that is why I am finding the current Captain Atom feature so confusing. He is in some fugue state. If General Lane has Captain Atom in his arsenal then things just got a little hairier for Superman. When Erik/Erika proved to be too unstable a mole for Zanetti, he contacted and recruited Natasha to be his double agent. She has a rank and a new name ... Jenny Blake. The only Jenny Blake I know is from The Rocketeer comic. Has Natasha's Jenny appeared anywhere? But then Natasha unloads the big secret. 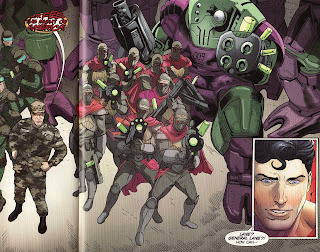 Project 7734 is led by General Lane ... the General Lane with his xenophobic ways and hatred of Superman. Natasha tells Jimmy she is in too deep to even warn Steel in case he gets threatened (a little late I think). She suddenly hears something and disappears leaving Jimmy on his own. 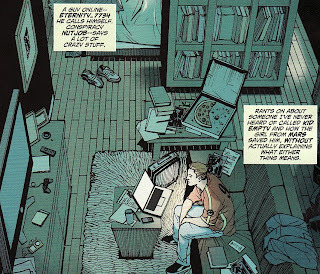 I have sung the praises of the widescreen format of comics when it is used appropriately. Here is another excellent use. As Jimmy walks out of the library he met Natasha in, he sees Agent Assassin floating down the street. This is such a wonderful suspense-building panel. Jimmy is in the foreground looking down the narrow channel of the street. Agent Assassin is close enough to be a real threat. But he is far enough away that escape is possible. The fact that he is so visible means that he wants Jimmy to see him. Jimmy has to realize that Assassin being so up front means that the agent is not their for reconnaissance. He is there for wetworks. There is no choice. Jimmy has to turn and run. Jimmy keeps slamming the signal watch but this takes place after Mon-El has been beaten by Mirabai over in Superman. Mon-El can't respond. 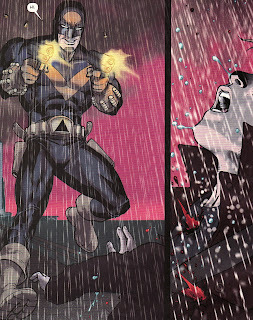 After a few pages of the chase, Assassin catches up with Jimmy and puts two rounds into his chest. Jimmy falls into the river and sinks. We are then shown the title of the issue ... 'The Death of Jimmy Olsen'. Now there are innumerable ways that Jimmy survives this. Kevlar vest with blood packets? Nearby superhero (maybe Natasha) pulling him from the river? Turtle boy transformation? So I think the title is more of a symbolic death of Jimmy. Since 7734 believes Jimmy is dead, when he ends up surviving he will have a bit more freedom to investigate. I have to say that much of the finer points of Erika and Natasha's dialogue was lost on me. There is a lot more mystery there. But the broad points were made adding to the threat of Project 7734. And as I said, I like this maturation of Jimmy's character into an intelligent and hard-headed investigator. Bernard Chang's art was fine here although I enjoyed his recent work on Wonder Woman more. I rarely talk about the price of comics (it is such a downer topic) but this issue was a hefty $4.99. I wonder if that alone would turn people away. I think the story could have been compressed a bit (there were 7 pages of the burning house!) to get the page count down into the $3.99 range. Superman #691 marked the conclusion of the Codename:Patriot crossover but clearly the reverberations of this plot are going to be felt for some time. There were no pat endings here. One thing this arc did show is the sheer cunning that General Lane has. He has plans on top of plans and recognizes not only the weaknesses in his opponents but also how to capitalize on those weaknesses. He seems quite pleased with himself at the end of this issue but pride always comes before the fall. James Robinson does a good job of making sure the story gets where it needs to. There are a couple of things that we have not seen which I would have liked to know now. For example, while we know that Lane's troops have defeated Flamebird, Nightwing, and Supergirl we don't know what they have done with them. Are the heroes lying unconscious where they fell? In a Project 7734 holding cell? Since deception was such a key part of Lane's plan, I would have liked to see what he did with them. Renato Guedes did the bulk of the art for the issue although the last pages are done by Eduardo Pansica. Their styles are quite different so there was a jarring feel to the flow of the issue. 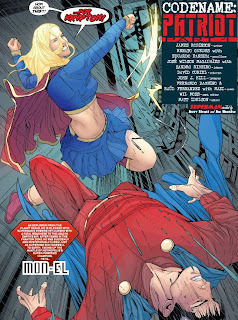 Last issue ended with Mon-El and Supergirl (Mirabai) chasing 'Kryptonian nationalists' Nightwing and Flamebird (Reactron and Metallo). Supergirl leads Mon-El into the Metropolis sewers saying she overheard 'Nightwing and Flamebird' talking about blowing up the water systems of the city. While underground, Mon-El is defeated by the villains who drop their glamour and reveal who they really are. The more we see Mirabai, the stronger she is shown to be. Wielding magic is one thing. Punching a Daxamite is something completely different. 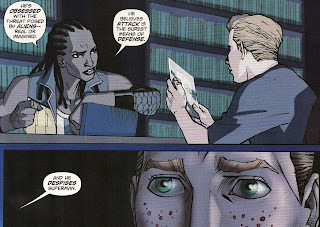 In fact, she is strong enough to make Metallo apologize for calling her 'baby'. Knowing Metallo, it takes a lot of power to earn his respect/attention. That says a lot about Mirabai. As does her statement that she finds the sewers 'confining' and wants to leave. I remember that Legion villain Mordru's weakness was severe claustrophobia to the point of becoming catatonic when buried. Could that be a clue to Mirabai's origins? We know little about Mirabai's back story but I am okay with it here. Her role in the story is different than someone like Superwoman where I felt we needed to know more once the identity was revealed. Here I can roll with it a bit. The 'blow up the water system' part of Mirabai's ruse turned out to be true. With Mon-El unconscious, the villains trigger their explosives, caving in the sewer system and wreaking havoc in Metropolis. This might be an overlooked page in the issue but I thought this was another time the 'widescreen' approach to comic art mattered. 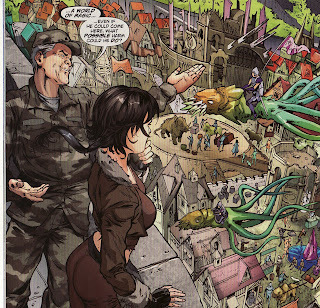 On this 2 page spread (I am only showing a small part of it) we actually see the citizens of Metropolis enjoying the day until explosions rock the city and send people scattering. Sometimes I think comics lose the 'common person' perspective on the metahuman events happening around them. 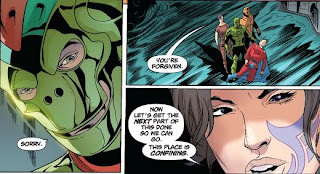 Now could those 2 pages have been better used to show what Mirabai did with Mon-El (leave him buried or carry him off) or what has become of Supergirl? Maybe. But I thought it was nice to show how the interplanetary plans of 7734 still have a street-level impact. Unfortunately, 7734's camera drones are everywhere. The 'Supergirl' attack on Mon-El is broadcast on Morgan Edge's show fanning the flames of public fear of Kryptonians. 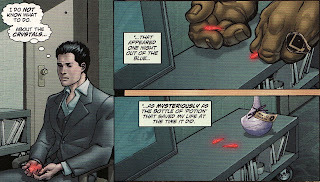 It also further cements Lois' feelings about Supergirl. Lois thought Kara was irresponsible about Superwoman. Now Lois sees Kara taking out Mon-El? My hope would be that Lois would see through the charade but she seems all to ready to write off Kara. Using Morgan Edge as a propaganda tool is another way of showing how far-reaching General Lane's plans are. He has thought about his anti-Kryptonian agenda on all levels - military, governmental, and the average person on the street. The actions in Metropolis are really just a delaying tactic to make sure that Superman and Ral-Dar are isolated as they streak to Markovia. Remember, Ral-Dar thinks this economic summit is a war council where Earth will declare war on New Krypton. Superman actually is close to subduing Ral-Dar on his own when General Lane reveals himself ... and the troops he has brought with him. Stunned into near silence, Superman is surprised to not only see Lane alive but to hear that Ral-Dar knows him. Before Ral-Dar can explain anything to Kal, Lane gives the order to 'fire at will' at the Kryptonians who have to be assumed to be a threat to the president. The next 2 pages show Superman and Ral-Dar under a withering barrage of Kryptonite lasers. 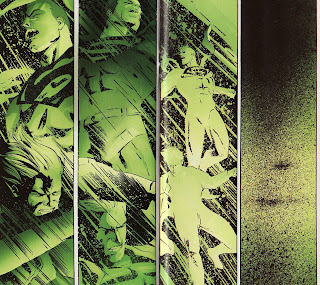 It is a good couple of pages, almost Frank Miller like in rendition. It really conveys the power behind these guns as the two Kryptonians just seem buffeted by the blasts. If the military has access to such weapons, maybe we would have a shot against a Kryptonian invasion. Not a great shot ... but a shot. Here is the one let down moment of the book. So after a two page 'wide screen' spread of shots showing the power of these weapons, Superman simply emerges from the green haze apparently unharmed. 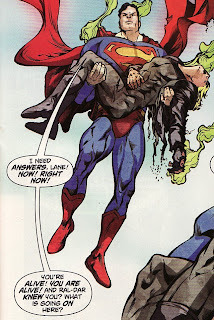 Even more confusing ... Ral-Dar is not only effected by the weapons but appears dead in Superman's arms. How can there be such a wide discrepancy in the weapons capabilities? Is this going to be a Kingdom Come like explanation where Superman has absorbed yellow sunlight for so long that he would be more resilient to Kryptonite exposure than relative newcomer Ral-Dar? I would have liked one line about this here. Some explanation thrown out so I don't have to make my own conclusions. Moreover, I would have liked to have one line about Ral-Dar. Is he dead? Unconscious and grievously wounded? Obviously, Lane needs to kill Ral-Dar to make sure all his plans and chicanery are not revealed. That said, if Lane knows that he needs to kill off Ral-Dar for that reason, the same would be true for Flamebird, Nightwing, and Supergirl. Add to this confusion about the weapons is the sudden shift to the Pansica art which is much muddier than Guedes is elegant lines. 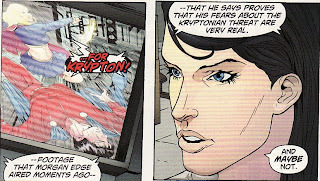 Before Kal can question General Lane about anything, he is urgently called back to New Krypton by Alura. Cradling Ral-Dar's body in his arms, he flies into space. 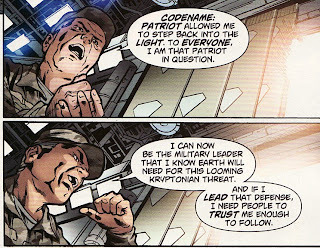 The book ends with Lane explaining why he activated the Codename:Patriot plan. He is Codename:Patriot! He reached a point where he needed to be more overt in his actions against Kryptonians. He could no longer accomplish his goals from the shadows. By setting up these events as he did, by sowing the seeds of paranoia, by making people question their faith in their heroes, he was able to come out of the shadows as the defender of Earth. With public support behind him and officials fearful of their lives, Lane will most likely be given the keys to the kingdom. Much like I have a grudging respect for Vril Dox in R.E.B.E.L.S., I have to respect Lane's plan and his ability to pull it off. Codename:Patriot did everything he wanted it to. And it was a pretty simple and efficient plan. My only question is what he does with everyone who knows what happened. Why would Lane leave Supergirl or Thara or Chris alive if he had them in his clutches. Wouldn't he, of all people, simply eliminate them? Furthermore, his alliance with Mirabai is shown to be deeper than I expected. Project 7734 has moved it center of operations to Mirabai's world of magic. It's a place of dragons, flying squids, and trolls. There is an interesting panel I did not show here. Mirabai tells Lane "that was our deal wasn't it? You help me. I help you." The next panel shows a large dragon eating a smaller one. So who is the large dragon here? Is Lane using Mirabai the way he seems capable of using anyone? Or is Mirabai lying in the weeds, feigning a weaker stature but ready to eliminate Lane when it suits her. It is that marriage of words and images that makes comics such a great medium. Maybe I will scan them in later. As for this world ... I don't particularly recognize it. It does make it less likely that Mirabai is a Native American as some folks postulated. 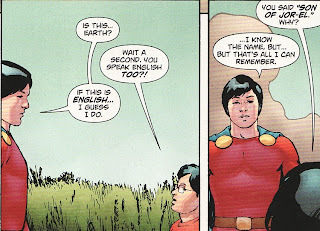 It did feel a bit too convenient that Superman got called back to New Krypton right before he is able to question Lane. How would the story be different if that call came even one minute later? On his way back to New Krypton, Kal listens in to the airwaves now filled with anti-Kryptonian rhetoric. 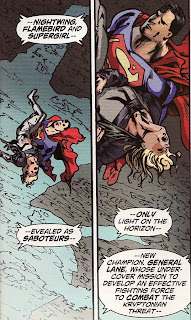 Nightwing, Flamebird, and Supergirl have all been labelled saboteurs. Mon-El has been listed as dead. And Superman has no answers. This didn't seem like an ending as much as a new beginning. This is the next phase of the New Krypton story. This review as a whole reads a bit more up and down than I thought the issue was in total. I actually enjoyed this issue a lot if only for showing just how nefarious General Lane is. Things are a little hotter in the super-family's world right now. It suddenly struck me that this week's release included Wednesday Comics #8. We're two-thirds of the way through! Only 4 more weeks to finish up the stories. The thing is, despite the fact that I am sort of blase about a handful of strips, I am going to miss Wednesday Comics. It has succeeded in doing exactly what it was set up to do. It has invoked a sense of anticipation in me much like I had for the Sunday comics as a kid. Each Wednesday afternoon I open up the paper and sit down with a cup of coffee and read. 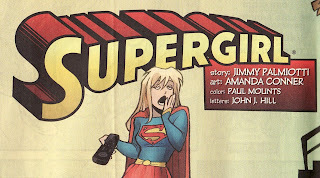 And each Wednesday night, I gather up the supergirls at home and read them the Supergirl strip. 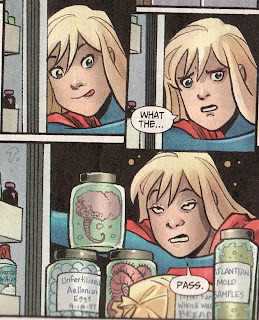 It definitely helps that I have enjoyed the Supergirl strip so much. This week's chapter is another winner. This week's emotional theme is bored. I love the glazed eyes on Kara as she yawns, the remote control almost slipping from her hand. 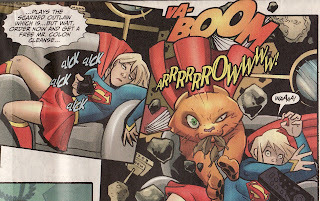 Last week's strip ended with Supergirl bringing the super-pets to Doctor Mid-Nite's for a check-up. While Doctor Mid-Nite runs exhaustive tests (I love the brain-wave scan picture with the pets wearing colander-looking devices), Kara becomes bored. Like any teenager she decides to raid the fridge and watch some television. Unfortunately, the refridgerator is stocked like a laboratory fridge should be with tissue samples and chemicals. I love the disappointed bordering on nauseated look on Kara's face. In the meantime, Krypto and Streaky are keeping a very close eye on Doctor Mid-Nite's pet owl. Despite the lack of snacks, Supergirl slumps on the coach and begins flipping incessantly through the channels hoping to find something to catch her interest. Her ennui is suddenly broken by Streaky crashing through the wall, owl tail feathers poking from her mouth. What is up with that cat?? Supergirl grabs Streaky and finds Doctor Mid-Nite trying to free his owl from Krypto's teeth. The good doctor tells Kara he thinks he has figured out why the pets are acting so crazy. This strip continues to be cute and funny. I love how exasperated Supergirl looks when the pets start acting insane. I also like the sight gags that Amanda Conner has been slipping into the strip. This week we see some interesting books on Doctor Mid-Nite's book shelf including 'The Idiot's Guide to Brain Surgery' and 'Cooking for Metas'. So ... before it gets revealed ... any guesses on the cause of Streaky and Krypto's behavior? I am thinking red kryptonite. As for the rest of Wednesday Comics, a few different strips slipped their way into my upper tier. Deadman has always been close to one of my favorite strips. The art has been solid the whole time, sort of a Dave Mazzucelli riff with demons straight from a Guillermo Del Toro movie. The story has also been interesting. A Deadman story where he is corporeal? It is becoming clear that Deadman is being played a bit here. My guess is the beautiful women in the strip will be revealed to be the true villains while the large imposing demon is actually a good guy. Don't judge a book by its cover. Teen Titans, which has been an afterthought for much of the last 8 weeks, has been steadily improving. I liked seeing Sean Galloway's take on some more classic villains in Titans history. I also like how Robin is emerging as the main hero in the strip. And Batman has just been more engrossing week after week. Azzarello and Risso have spun a very noir tale. Kamandi and Strange Adventures continue to be very very strong, probably my two favorite strips in each week. 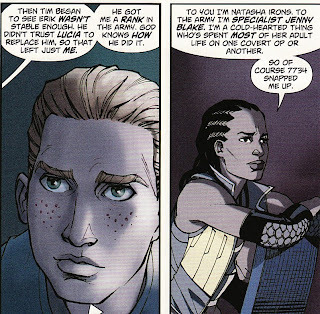 I love how Alanna is portrayed as more than just arm candy for Adam Strange. Despite being written by Walt Simonson and drawn by Brian Stelfreeze, two of my favorite creators in comics, I just can't get into Demon/Catwoman. And Metamorpho was a little too cute for me this week. Overall, this was a very strong week. I promised another peek back at the Kryptonian Fire Falls after my quick review a couple of weeks ago. And so let's take a look at Action Comics #324. The story was written by Leo Dorfman and drawn by Supergirl legend Jim Mooney. 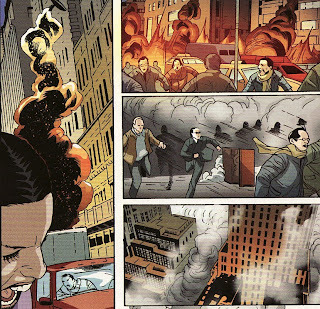 We saw the new Fire Falls earlier this month in the Superman:Secret Files 2009. But I think that Action Comics #324 is the first appearance of this geographic area of Krypton. 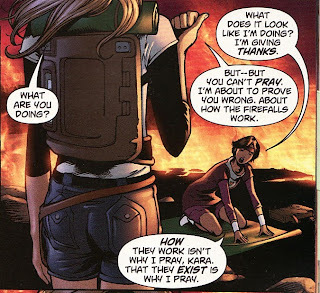 The issue starts with Supergirl flying in India when she sees a snake charmer named Abdul who has been accidentally bitten by the poisonous serpent he was charming. 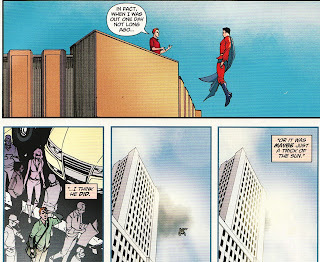 Supergirl flies to his aid but she is too late to help him. Just before dying he reveals to her a set of devil's horns under his turban. He gives her a ring, explaining that is how he obtained his magic powers. Of course, a small piece of the explanation of the ring falls off leading to some confusion later on. Supergirl accepts the ring and flies off. Before leaving, she sees his body placed on the funeral pyre, part of his land's customs. Back in Midvale, Supergirl as Linda decides to investigate the ring she was given. It is clear the ring is evil, forged in the likeness of the devil's face. There is even a cliched lightning strike as Linda opens the box. But with great evil power comes great evil consequences. Should you use the ring three times, you will become a demon. The cure unfortunately was on the last line of the paper which blew away. 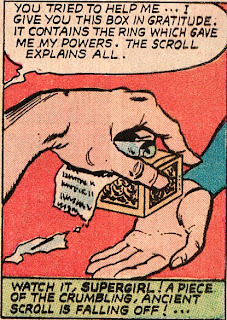 Supergirl resolves to simply not use the ring. No usage ... no possession. But the best laid plans often go awry. 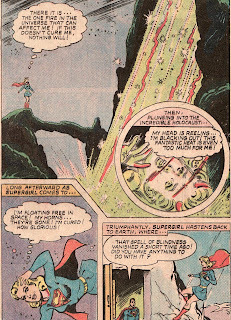 Almost immediately Supergirl has to use the powers of the ring to save Superman from a boulder of Kryptonite he stumbled upon in a cave. The ring's powers manifest as skeletal hands which carry out the wish of the owner. Kara feels the chill of evil as she rescues her cousin. Not much time passes before she is forced to use the ring again. A violent rain storm has knocked out power in the town and washed out a bridge. Unfortunately, the governor was racing over the bridge to stop the prison execution of a man suddenly found innocent. Supergirl has her hands full fixing the bridge and therefore can't rush to the prison. With no phones and no bridge, the man is doomed. Supergirl decides to use the power of the ring. I have to say this is a pretty creepy scene especially for the early 60's. 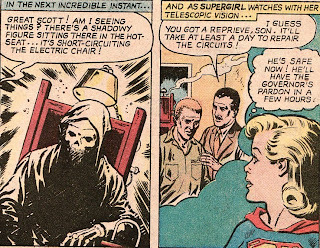 As the man is being dragged to the chair, a death-like figure appears in the electric chair and receives the lethal voltage. The chair short-circuits. The man is spared until repairs can be made. Of course, before that happens, the Governor is able to cross the fixed bridge and exonerate the innocent man. Still, that's two uses of the ring. The road to Hell is always paved with good intentions. 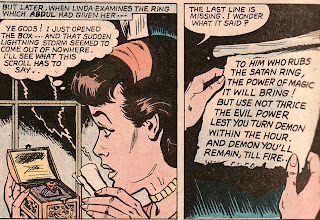 And, unfortunately for Supergirl, she once again needs to use the Satan ring to do good. This time her father Fred Danvers suffers a massive traumatic brain injury when he gets in to a car accident. The neurosurgeons feel he is beyond help. But Supergirl wishes the ring to help the doctors and suddenly a miraculous and innovative life-saving surgery happens. Look at the doctor, eyes glazed and asking for instruments. Danvers is saved! Alas, that is the third use. Supergirl is fated to become a demon. Within the hour she sprouts devil horns and feels compelled to do 'fiendish deeds'. Soon after, she is stirring a bubbling cauldron with a pitchfork. 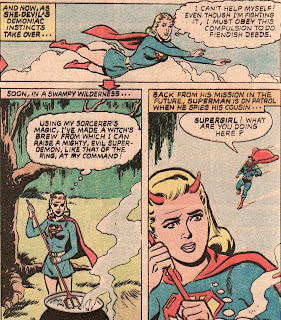 There is something so deliciously Silver Age about a devil-horned Supergirl making a witch's brew. The brew will allow her to bring forth an evil super-demon. Before she can complete the spell, Superman arrives. As much as Supergirl tries to fight the evil compulsions within her, she cannot. She has the brew steal the sight of Superman, the scene represented on the cover. 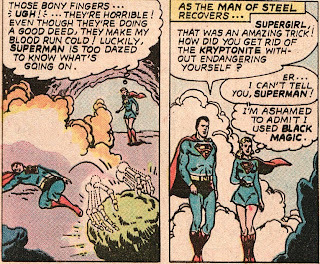 Shaking off the evil influence for a short time, Kara tells Superman to stay in the Fortress of Solitude while she figures out a way to break the spell. Temporarily in control of herself, Supergirl heads back to the site where she was given the ring. There she is able to find the last piece of the paper which says that only the purification of fire will cleanse her soul. In fact, she finds Abdul alive and well! He has been cured and revived by the funeral pyre he was placed on! 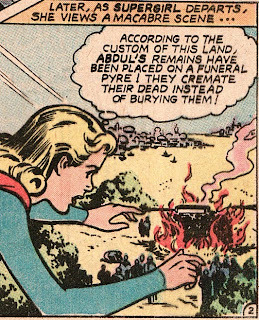 Realizing there is a way to cure her, Supergirl stands in all manners of fire ... flames, a volcano ... all of which have no effect. Flying into deep space, Kara comes across a small asteroid which has a blazing cascade of Kryptonite flames. Unsure if she will survive the conflagration, Supergirl dives in. She falls unconscious from the heat and power. When she awakens, her horns have gone and she has been cured. After a quick flight back to Earth, Supergirl finds Superman has been returned to normal as well. When Supergirl finally tells Superman the whole story, he realizes that Supergirl had bathed in the flames of the Fire Falls! 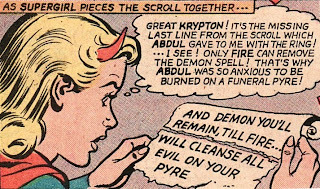 Somehow the Fire Falls were flung from the exploding Krypton intact, their flames radioactively changed to a type of Kryptonite fire. So the Fire Falls have had played a role in Supergirl's life throughout her history. Even with the Fire Falls reference, this story doesn't have any major impact on Supergirl's history and therefore wouldn't be a crucial part of a Supergirl collection. 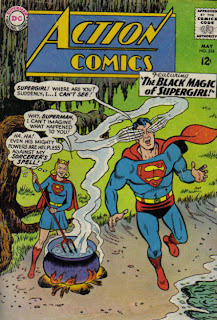 That said, if (like me) you can't resist things like Supergirl stirring a cauldron with a pitchfork, it might be worth buying it if the price is right. Superman Annual #14 continues the origin theme running through all the super-annuals. Action Comics had the origin of Nightwing and Flamebird. Supergirl will have the origin of Superwoman and Linda Lang. The annual not only recapped Mon-El's origin but also shed light in the origin of Daxam as a whole. Written by James Robinson and drawn by Javier Pina, it certainly provides significant back story for Lar Gand. The annual starts with a bit of a deus ex machina as Mon-El discovers 2 small red crystals which, when touched, seems to download historical data into Mon-El's mind. After some small interactions with the crystals and some glimpses of his past, Mon-El finally gives in and opens up his mind to them. These are the crystals that Sodam Yat gave Tellus a few issues back. But how does Yat have them? And why does he feel that Mon-El needs this information now. And does this mean that Tellus was responsible for the curative potion? Hopefully all these questions surrounding Mon-El will be answered. Daxam's past actually begins on Krypton! 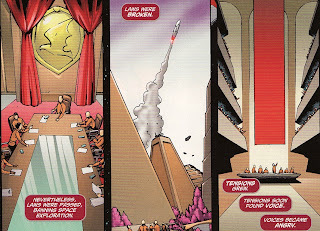 Back when Krypton was an expansionist society, it visited and invaded many worlds. Some of these invasions failed - like these images from (I assume) Tamaran, Imsk, and Durla. But others succeeded. 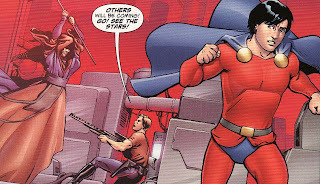 Kryptonian explorer Dax-Am led the expedition to Mon-El's homeworld. Not only was Daxam conquered but the Kryptonian conquerors accepted the Daxamite natives, even co-mingling with them. After a few generations, the people on the planet no longer considered themselves Kryptonians. They were Daxamites. Hmmm ... so Kryptonians and Daxamites are cousins with the same ancestors. Interesting. While we might be used to reading Daxam as an isolationist planet, in its infancy it also was led by explorers. But rather than conquest, the Daxamites hoped to share with and learn from other cultures. We see the Daxamites landing on a number of worlds peacefully - planets whose names I don't know but which look like the home worlds of Tigorr, Blok, Tomar-Re, and Despero. It looks as though they even journeyed to Earth. It looks as though they were the reason why the Incans were so advanced. And those interspecies relationships and co-mingling continued here as well. We see a female Daxamite explorer talking with an Incan about their love for one another. Realizing a Terran/Daxamite child would have powers under Earth's yellow suns and this child might upset the balance on the planet, she returns home. Fearing she and her child might be shunned because of this racial status, the space traveller stashes her ship when she returns home to Daxam. She realizes she might need to beat a quick escape back to Earth. The child is born and lives on the planet (I presume) without any major incident. But the Terran genes spreads over the planet and all descendants of that Daxamite seem to crave the stars and have a need to return to their ancestral home world of Earth. 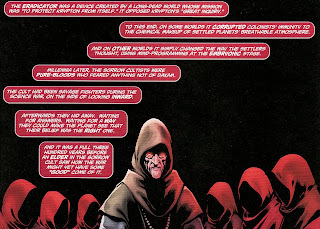 However, those with more pure Kryptonian heritage wish to stay on Daxam and become more and more isolationist. The two groups cannot reconcile and as a result a civil war ... The Science Wars ... breaks out. I don't know if I like how there is a genetic disposition to want to explore or stay isolated. The Isolationists win and form a ruling body called the Sorrow Cult. This cult comes to power centuries after the war and rewrite the history books instilling a fear of expanding into the minds of Daxam's citizens. They literally shut down the skies of the planet. 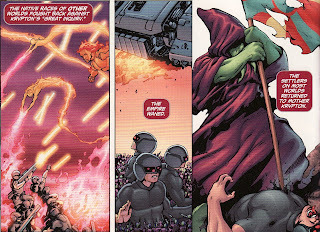 At some point in time The Eradicator also comes to the world to help purge the sin of Kryptonian expansion. It makes sense that he would target Daxam. Moreover, it is hinted at that it was the Eradicator who tinkered with the Daxamite genome, giving the natives their vulnerability to lead. It is simply another way to keep the Daxamites on their home planet. The inclusion of the Eradicator is interesting. I liked the Eradicator concept back in the Byrne/Jurgens Superman era so it was nice to see it still kicking around in current continuity. Despite the ban on space exploration, some Daxamites (especially those with the Earth genes) still wish to reach for the stars. At last we see a young Lar Gand, who along with a friend named Van, have discovered the abandoned space ship from the female Daxamite explorer from millenia past. Gand thinks it should be used. When a Sorrow Cultist learns of their plans, the Cultist breaks into the duo's lab with the plan to arrest the two for treason. Van tells Lar to run off and use the ship while he deals with the authorities. 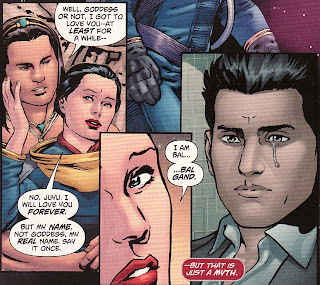 Hmmm .. this might explain why Sodam Yat was so interested in Mon-El. He could still be wanted as a criminal on Daxam! The ship takes its preprogrammed flight back to Earth but crashes in Smallville rather than Peru for some reason. There a confused Mon-El meets a young Clark. I think we know the rest of Mon-El's history from this point. Well ... almost all of it. It turns out that the woman Daxamite who introduced the Terran gene on Daxam is named Bal Gand and is a direct ancestor of Mon-El. One thing I'll say about James Robinson, he is doing his best to make me want to care about Mon-El. 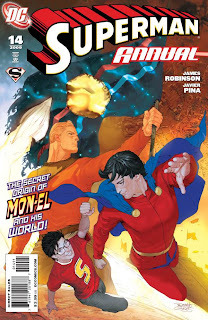 By weaving Kryptonian and Earth into Gand's heritage, Robinson has put forth a new spin on the character. But I don't know if I care about Mon-El enough to want to read about centuries of Daxam's history. I guess I have to wonder if all these changes are an improvement on the past origins. Is the Bal Gand revelation a way to give some sense of destiny for Mon-El's activities on Earth? Why would Tellus/Sodam Yat think Mon needs to know all this now. Why do I as a reader need to know all this now? And doesn't it all fit together almost too neatly? I did enjoy how so much of the DC universe was seen here, how much reach Krypton and Daxam have had. 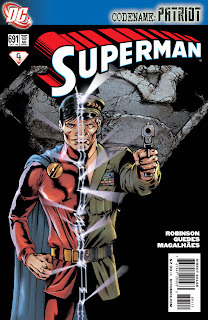 I admit Robinson's Superman has left me somewhat wanting. This annual left me feeling the same way. I feel like I have enough back-story for everyone we have seen in the book. Now I want story. Now I want to see how it all fits together and moves forward.